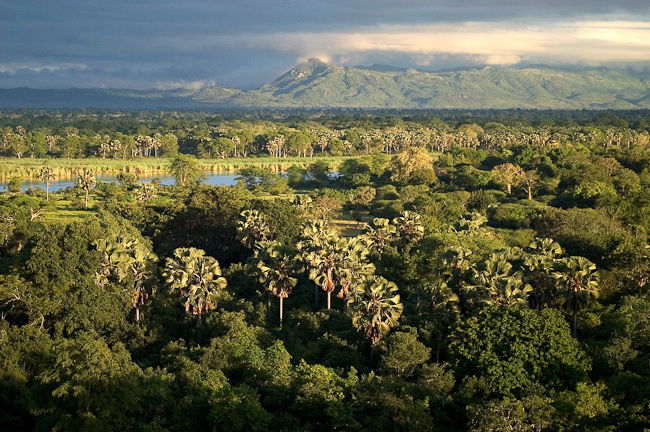 The 580 square kilometre Liwonde National Park is situated in the south of Malawi and is the country's premier wildlife reserve. Liwonde incorporates the huge, scenic Shire River as well as quiet backwaters and lagoons, marshes, open savannah country, woodland and hills in the interior of the park. As a result of the wide variety of habitats, there is a great diversity of plant, animal and bird life present. Elephant, Sable and Black Rhino are the main game attractions. The bird life is outstanding - it is possibly the best birding location in Central and Southern Africa. The record for a two-night stay at Mvuu is 266 different species counted. Mvuu Wilderness Lodge nestles discreetly on the banks of a lagoon just off the Shire River with the main lounge building set high above the water for wonderful views. Mvuu means "hippo" in Tonga and the name epitomises the large numbers of pods of these water-loving mammals that float in the river. In this lush and fertile area, an excellent diversity of animals - including elephant and sable antelope, impala and waterbuck - can be seen. Mvuu Camp and Mvuu Wilderness Lodge are both situated on the banks of the Shire River in Malawi's Liwonde National Park. Mvuu Camp offers a wide range of options including camping, self catering and full board rates with activities. The activities on offer are the same as Mvuu Wilderness Lodge, but the camp is better suited either to families or those on a budget, as rates are very reasonable. A particularly rewarding way of arriving at Mvuu Camp is via the boat trip from Liwonde Town. This river trip takes you 30 kilometres along the Shire offering an excellent chance to see game and birds en route and also the ever changing scenery and vegetation along the banks. Mvuu Camp and Mvuu Wilderness Lodge are both operated by Wilderness Safaris. Mvuu Wilderness Lodge is a small and intimate lodge, stunningly situated on a lagoon close to the Shire River in the north of the park. Discreetly tucked away in thick riverine vegetation, accommodation in this luxury camp comprises eight spacious tents for a maximum of 16 guests, each with en-suite bathroom facilities and a private viewing platform looking out on the lagoon. Lodge facilities include a dining room, pub, lounge area, extensive wildlife library, a hide overlooking the river and a natural rock swimming pool. The main dining room/pub/lounge area is raised under thatch overlooking the Shire River where Elephant, Hippos and Crocodiles are often viewed. Enjoy meals on the deck or under thatch. The dining area is connected to the rest of the lodge by wooden walkways and leads onto the swimming pool, which is made of natural rock and is surrounded by a deck of fragrant Mulanje Cedar. The entire camp boasts a backdrop of indigenous Fever Trees. Just downstream from Mvuu Lodge, the camp is a clever mix of stone and canvas chalets and specially-designed family tents, totalling 12 units. An impressive thatched dining and lounge area is situated nearby, offering a magnificent river vista. Dinners are sometimes held 'under the stars' in a specially constructed boma. There is a new custom-built education and conference centre with facilities for up to 40 delegates or smaller corporate and team building functions. Mvuu is the only lodge/camp in the Park and is therefore able to offer exclusive boat trips and game drives both during the day and at night. Boat trips in stable handmade wooden boats are the highlight and offer the best opportunity for viewing the Park's large herds of Elephant. Night boat trips are a specialty, where with the help of spotlights, guests are able to encounter the huge Crocodiles of the Shire River up close, as well as look for two of the Park's 'special' birds, the Whitebacked Night Heron and Pel's Fishing Owl. Walks with qualified scouts are another recommended activity, as the wildlife in the park includes large breeding herds of Elephants, plenty of Hippo and Crocodile, Sable Antelope, Impala, Reedbuck, Oribi, Leopard and Serval. Bird life is prolific and the park is justly regarded as one of the finest birding locations in south and central Africa - not just for the number of species, but for the ease with which specials can be seen. In addition, guests can do great bicycle trips from the boundary of Liwonde to the local villages outside the park, giving one a superb cultural experience. Guests may also experience a night in Ligwangwa, a typical rural Malawian village. The activities offered and the areas visited are the same for both Mvuu Wilderness Lodge and Mvuu Camp. Liwonde was proclaimed as a National Park in 1973 and in 1995 Mvuu Wilderness Lodge was opened, Wilderness Safaris being the first private company to win a tender inside a Malawian National Park. The 548 sqkm Park, named for Chief Liwonde who had championed its protection, harbours very diverse landscapes. Relatively dry mopane woodlands cover the eastern half of the Park where they are interspersed with unworldly candelabra trees, while patches of miombo woodland occur on the limited hill slopes in the south and east. Palm savannah and numerous baobabs abut the extensive floodplains of the Shire where dense riverine vegetation adds a tropical feel to the habitat. Liwonde is home to the largest remaining elephant population in the country and one of only two breeding nuclei of black rhino in Malawi. The Park also has large numbers of impala, reedbuck, waterbuck, warthog and majestic sable, the last a species quite uncommon anywhere in Africa today. Kudu and impala, together with sable herds, haunt the woodlands beyond the floodplain, while yellow baboon entertain guests with their social antics. Buffalo, Lichtenstein's hartebeest, zebra, roan and eland were historically hunted to extinction in the area, but have since been introduced into what is known as The Sanctuary - a substantial 4 000ha fenced area within the Park that serves as a reservoir for rare species. It is here that Liwonde's black rhino find refuge too. A dense population of hippo can be found in the Shire River and monstrous Nile crocodile are found lazing on the sandbanks. The birdlife here is prolific - probably the best year-round birding of any camp. Over 300 of the country's 650 bird species occur in the Park with gems such as Böhm's Bee-eater, African Skimmer, Palmnut Vulture, White-backed Night-heron and Dickinson's Kestrel. Others such as Livingstone's Flycatcher, Pel's Fishing-owl and Spur-winged Lapwing can also be found in the riverine strip while Liwonde is home to the only population of Lillian's Lovebird in Malawi and also plays host to the rare Brown-breasted Barbet. About 500 people living outside the Park benefit financially from the existence of Mvuu Wilderness Lodge and Mvuu Camp. Wilderness Safaris are also involved in logistical support for the Park's game scouts, and help maintain Park infrastructure, as well as being involved in wildlife translocations and an annual census. Situated about six kilometres from Liwonde National Park's western boundary, Kafulafula School has only six teachers and over 600 children - many of whose parents work at Mvuu Lodge and Camp. The resources of the school have been boosted through a combination of financial assistance from Mvuu's guests and Wilderness - a new classroom block has been built and books and uniforms are supplied to the children on a regular basis. Thanks to committed donors and to Wilderness Safaris staff, Nanthomba School in the Machinga district of Malawi just outside the western gate of Liwonde National Park has become a reality. Its construction is the brainchild of three Mvuu Camp and Lodge employees who were inspired by Wilderness Safaris' Children in the Wilderness programme. Financial support of the project came primarily from the H.E.L.P. MALAWI Foundation and the school building was completed in 2007. Finally, Mvuu hosts over 2,000 schoolchildren annually from all over Malawi on day visits to Liwonde National Park and Mvuu Camp. This goes a long way towards encouraging a sense of appreciation and responsibility for Malawi's threatened natural heritage. The children are hosted by Wilderness Safaris' staff and taught by their schoolteachers about the importance of conservation. Often they include a boat trip or game drive in their visits. These are sometimes the children's first glimpse of wildlife in their own country!